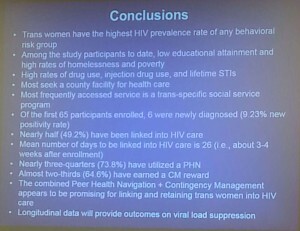 On Saturday, April 18, 2015, at the National Transgender Health Summit in Oakland, CA, I attended a wonderful breakout session done by Howard Brown and Friends Community Center: “A Novel Approach for Linking and Retaining HIV-Infected Transgender Women of Color into HIV Medical Care” (Cathy J. Reback, PhD; Jesse B. Fletcher, PhD; Kimberly A. Kisler, PhD; Kiesha McCurtis, MPH). Branding is very important because the trans community is lacking in trust, their family may have put them out, they may not be able to trust their friends, so it’s crucial to be consistent. 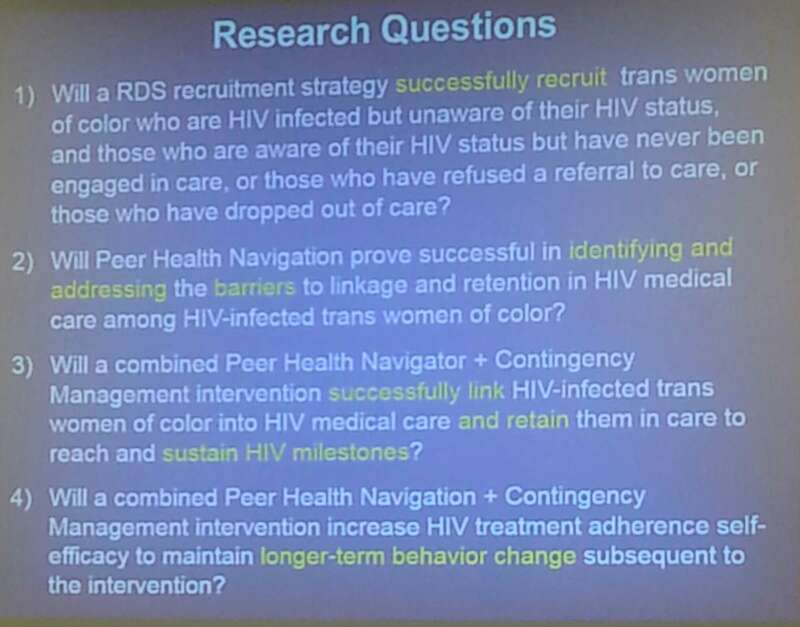 “The Alexis Project employs a multi-tiered, comprehensive approach, which includes network, individual and structural components to identify, recruit, test, link, treat and retain transwomen of color into HIV care. 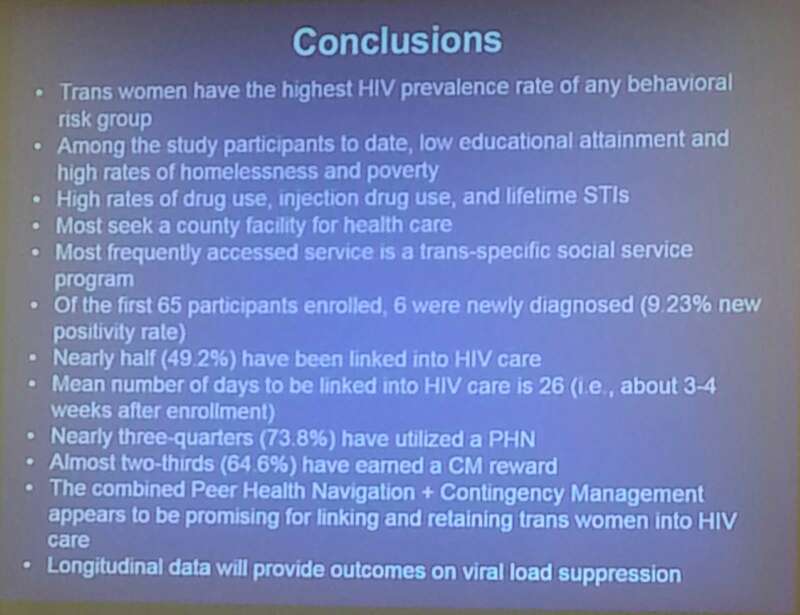 The Alexis Project incorporates three proven models, Social Network Recruitment (network), Peer Health Navigation (individual) and Contingency Management (structural), into one multi-leveled project to optimize HIV health outcomes for transwomen of color. 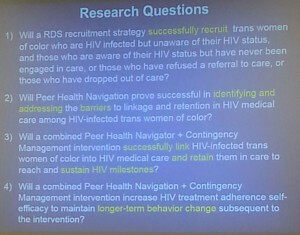 Through Social Network Recruitment, local transwomen recruit transwomen of color from their social, sexual and/or drug-using networks into the project for either testing (HIV unknown status) or (for those who are aware of their HIV infection but not in care) to the combined Peer Health Navigation and Contingency Management intervention. 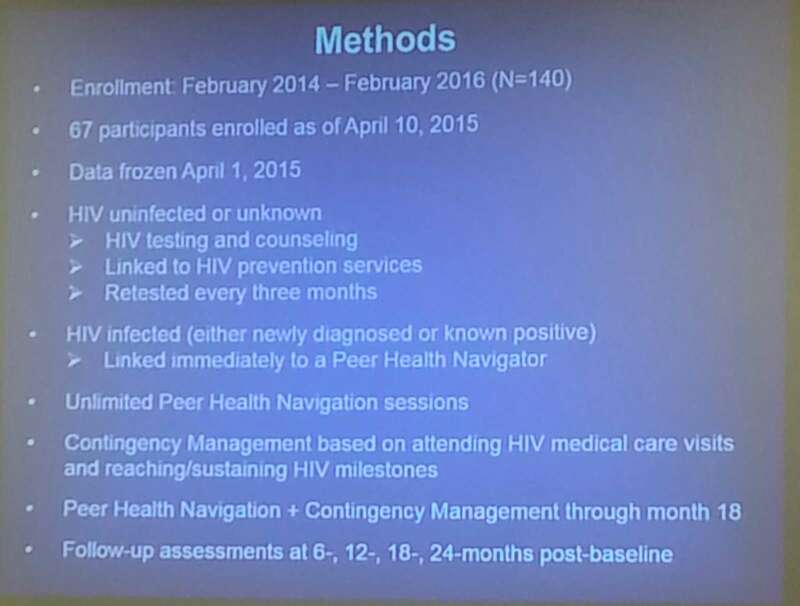 Participants may also be referred to the project through collaborating agencies or through street- and venue-based outreach. 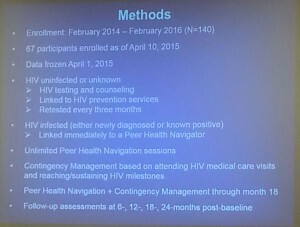 A Peer Health Navigator works with each participant to link and retain her in HIV care services and to identify other needed services. 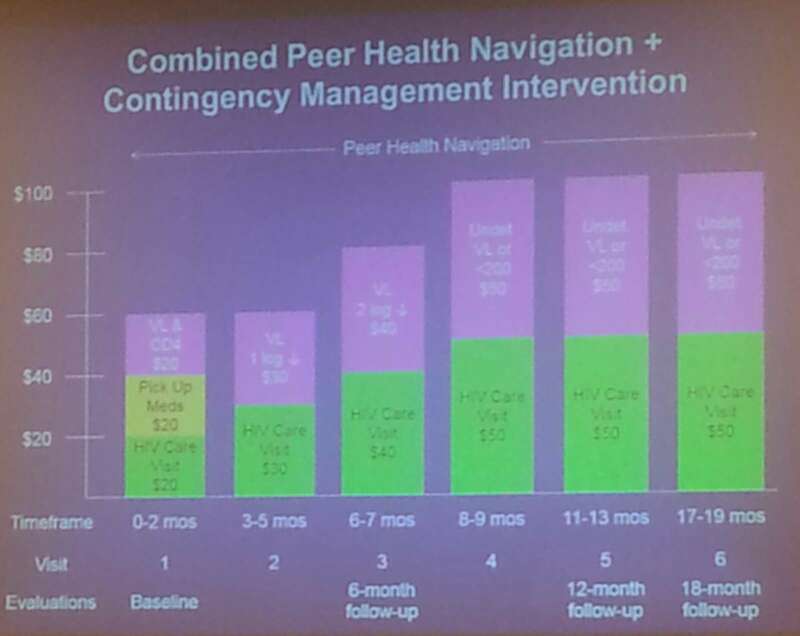 In addition, Contingency Management provides increasing valuable incentives (in the form of gift cards) for attending HIV medical visits and reaching and sustaining HIV medical milestones. At the breakout session, I was truly impressed by the amazing and lovely peer navigators, Miranda Ramirez and Angelina Alamilla, who spoke about the importance of their roles, and how they really support their clients every step of the way, from going to the DMV and helping them to get identification to going to medical appointments and advocating for their rights. 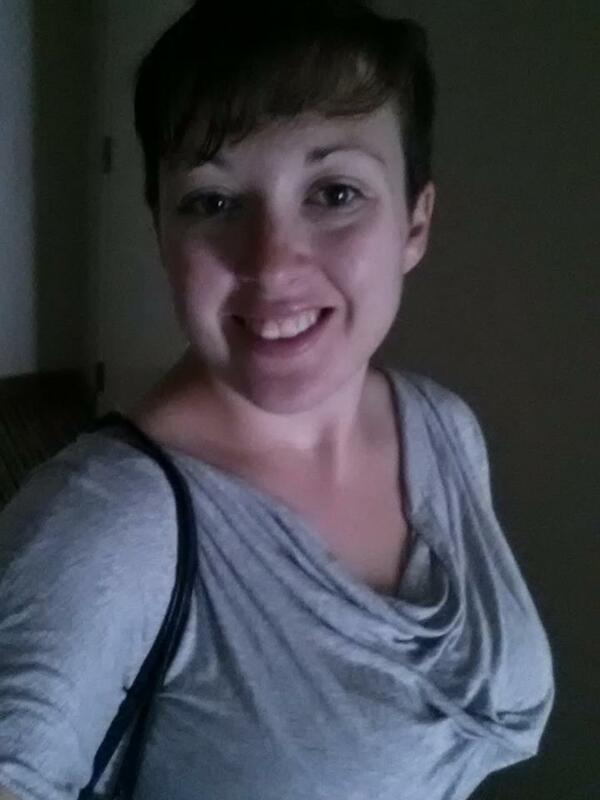 Caroline Watson is the Social Justice and Reproductive Health Intern for HIVE. She is also the founder of #WeAreAllWomen.